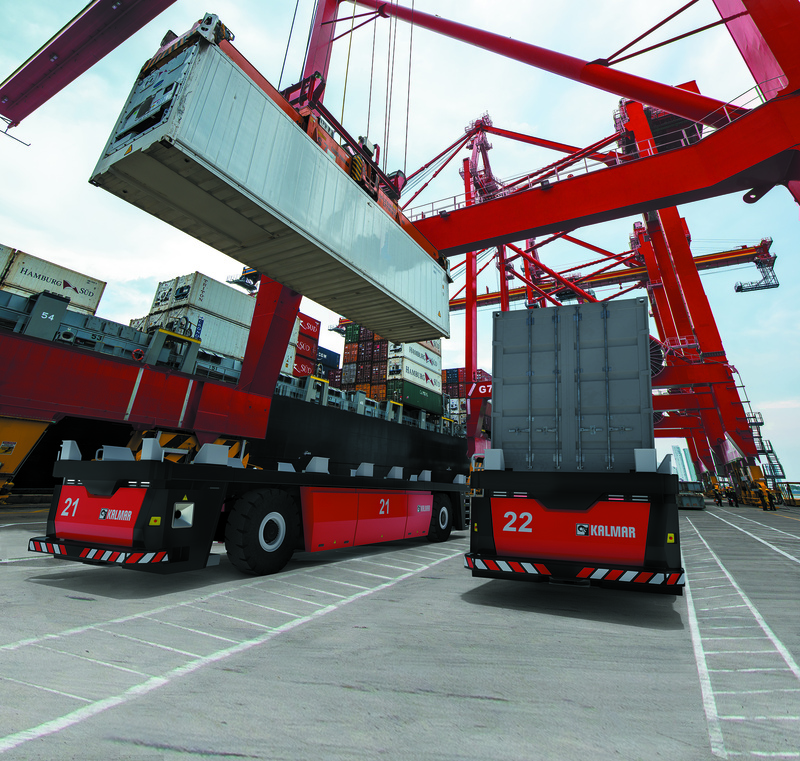 Kalmar, part of Cargotec, is introducing an automated guided vehicle (AGV) solution for transporting containers between quayside and landside operations. The new Kalmar FastCharge(TM) AGV is the latest milestone in Kalmar's successful 20-year track record of delivering innovative fully automated container-handling solutions to leading terminals around the world. The Kalmar FastCharge AGV is constructed on an optimised steel platform that can carry one or two 20-foot containers, one 40 or one 45-foot container and handle loads of up to 70 tonnes. The AGV features an eco-efficient electric power system that uses the latest in Lithium-ion battery technology, making it much easier and more cost effective to maintain and operate than a comparable machine powered by lead-acid batteries. The fully electric drivetrain also ensures zero emissions at source. Kalmar's FastCharge technology - already available for Kalmar shuttle and straddle carriers - eliminates the need for time-consuming battery swapping as machines can be opportunity charged at charging stations along their working routes. With recharging taking just a few minutes, equipment availability is maximised with the AGVs spending more time moving containers and less time idle. The Kalmar FastCharge AGV also features the latest in Lithium-ion battery technology as well as a regenerative energy system that stores energy from braking and makes it available for reuse. Customers can choose an integrated turnkey solution consisting of the Kalmar terminal logistics system (TLS) and Navis N4 terminal operating system. They can also take advantage of Kalmar Key, which enables integration of the Kalmar TLS with their existing terminal operating system (TOS) through a series of open application interfaces. Mikko Mononen, Vice President, Intelligent Horizontal Transportation, Kalmar: "The Kalmar FastCharge AGV offers both greenfield and brownfield terminals an alternative solution to reduce the environmental impact of their operations while maximising equipment availability. It complements our existing offering for horizontal transportation and is based on our proven TLS automation platform, which includes AGV support for terminals using the Navis N4 TOS. Launching the Kalmar FastCharge AGV was the natural next step after the successful project with PSA Singapore, where we delivered a fleet of 18 customised electric AGVs at the end of June 2017." The Kalmar FastCharge AGV will be officially launched at the TECH TOC Conference on Tuesday 24 April. TECH TOC is the terminal operations conference stream of TOC Asia, which takes place on 24-25 April 2018 at the Marina Bay Sands resort in Singapore. Kalmar will introduce its latest technologies and solutions for the Asia-Pacific market as part of the event, at stand L20.